‘Nothing can quite prepare you for the excitement you feel when you first encounter a family of Gorillas’, says Rob who spent a week tracking Gorillas, Golden Monkeys and Chimpanzees on a ‘primates safari’ in Rwanda. ‘After an hour of uphill trekking through bamboo and dense woodland we came upon the group of Gorillas we had been tracking, and suddenly found ourselves right in their midst in a small clearing. The majority of the group were gathered together in a small hollow within the long grass, but 2 or 3 others were ranging about and one passed swiftly behind us and within a few metres. Immediately you’re aware that this is no ‘zoo experience’ – there is no glass pane or protective barrier here, you are very much on their territory and they are the ones firmly in control. These gorillas, in Rwanda’s strikingly-beautiful Volcanoes National Park, have been carefully habituated to humans and small groups such as ours of up to 8 people visit them each day for a maximum of one hour. 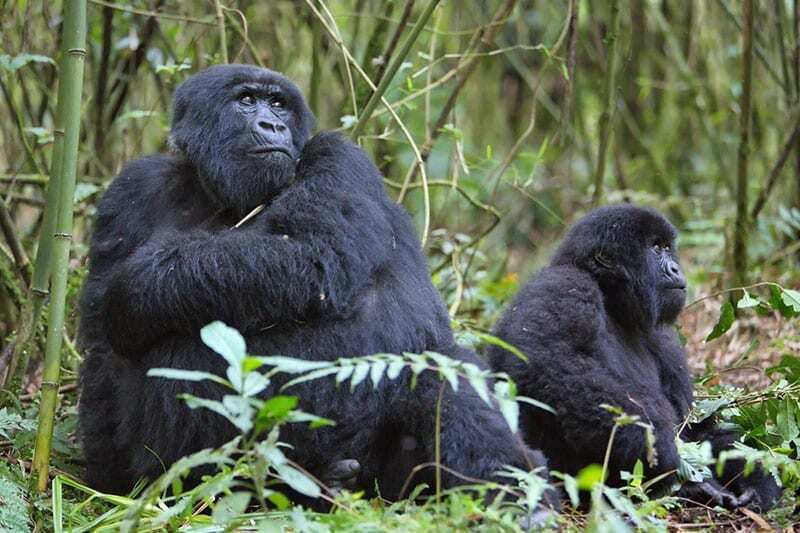 We watched the group – comprising one male silverback and various females and young, including twins of just a few weeks old – as they fed, groomed, and generally gambolled about. Our allotted hour sped by as we marvelled to each other in hushed voices at their gentle, playful behaviour. The next day we returned to the Park to track Golden Monkeys and watched a troop of around 40 capering through a bamboo grove just above our heads. Subsequently, we ventured on to Nyungwe National Park in South West Rwanda to track Chimpanzees and in early morning light on our second day we came across a group effortlessly moving about a giant fig tree 100 feet above the ground. Nyungwe is one of the few remaining tracts of original African montane rainforest and is one of the most endemic species-rich areas in the whole continent. I was spellbound by the dramatic scenery of the towering trees which rise majestically above the verdant tea plantations of the surrounding countryside. For help arranging a visit to see the Mountain Gorillas contact Rob for itinerary suggestions and helpful hints including why Rwanda is a better choice than Uganda for photographing the Gorillas and why a pair of gardening gloves are a good idea!